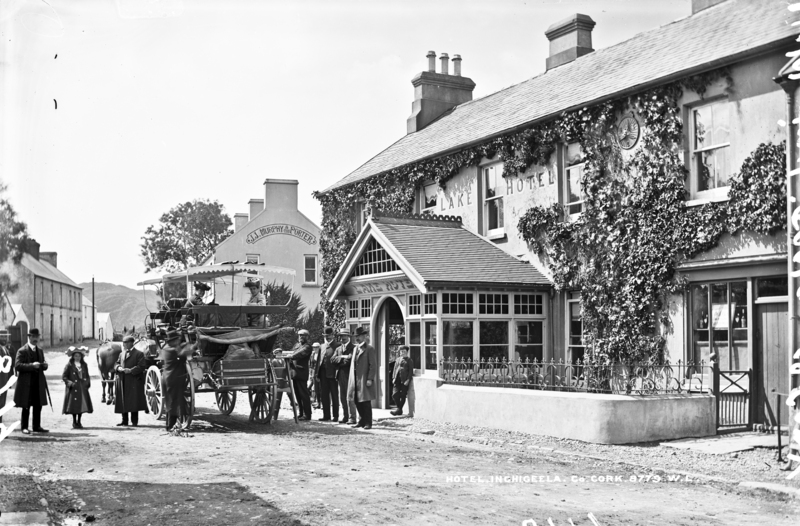 This delightful shot shows a "Charabanc" or "Omnibus" loading up with happy trippers outside the Lake Hotel in Inchigeela, County Cork. The image is full of detail including hats, horses, people - but any dogs? I see a CTC sign under the eaves, introduced from 1887 per the Cycling UK website. what a hat;second from left! Poking around the streetview linked above, I notice that the business is still called Lake House, and they have a more modern CTC sign at the far end of the frontage. There's a man wearing a straw boater at far left, so 1900-1910 somewhere? For the ladies hats (especially the spectacular one at left!) we could use [https://www.flickr.com/photos/la_belle_province]'s input. In this archive shot of the same group, we can read on the charabanc: No. 36 ...(IRELAND) LTD THE TOURIST ROUTE Killarney Glengariff Inchigeela Macroom Cork There is also a fine dog. A couple of those hats look like dogs. Two hoteliers iin Inchigeelagh 1901: Eliza Nolan and Mary Delea In 1911, just Mary Nolan. Mary Delea has aged 20 years, and her nephew-in-law is now the publican. I don't see any obvious candidates for Mary or Eliza Nolan in these shots. Guys confirms that Mrs. Nolan was running the Lake in 1907 (must be Eliza, as Mary is Single in 1911), and Delea's was another establishment. Niall, I'm on it, and thanks for the mention! There's a scene in Kind Hearts and Coronets with a pub that looks just like that hotel. [https://www.flickr.com/photos/beachcomberaustralia] Congratulation for your beautiful then-and-now find. [https://www.flickr.com/photos/[email protected]/] thanks for the old picture, nice!